Vaccination rates are up in 49 out of 58 counties in California, according to data released Tuesday by state health officials. The California Department of Public Health annually reports vaccination data for kindergartners at virtually all public and private schools statewide. For the 2015-2016 school year, 92.9 percent of kindergartners were up-to-date on their vaccines, an increase of 2.5 percentage points from last year. In California, 2015 was the year of heated debate around vaccines. 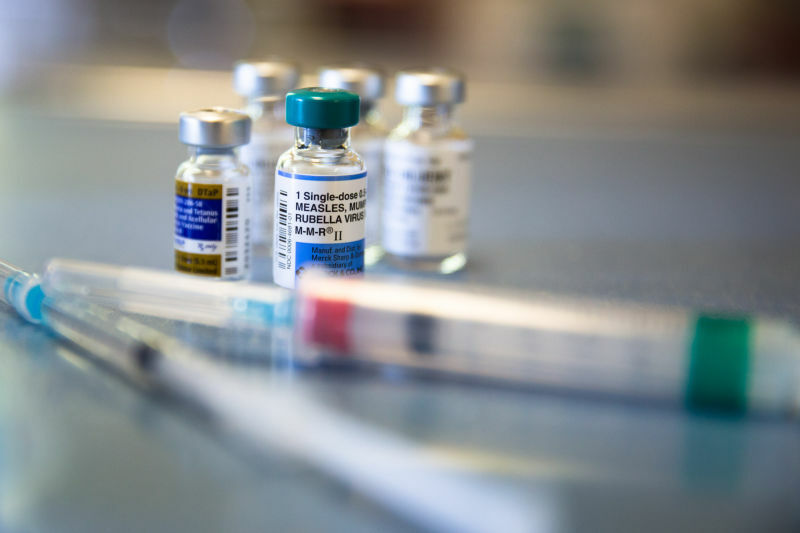 It started last January with the first reports of a measles outbreak tied to Disneyland. Then, in early February, lawmakers introduced a bill to eliminate the "personal belief exemption" (PBE) which allows parents to refuse vaccines on behalf of their children. The law takes effect in July, but this school year the PBE rate declined slightly -- it's now 2.38 percent, down from 2.54 percent last year. It's the second straight year of declines. While no one can say for sure exactly what's driving the increasing vaccination rates, it seems reasonable that all the focus on vaccinations -- and those who choose not to vaccinate -- last year had an impact. But James Watt, chief of the division of communicable diseases with the state's department of public health, says another big factor is "conditional admissions." These are children who arrive at school with some vaccines, but are not up to date. This school year, 4.4 percent -- about 24,000 -- of the state's 550,000 kindergartners were admitted conditionally. The problem, Watt explained to me in an interview, is that the rules around conditional entry are actually quite strict. It's not simply that a child has some vaccines and will get the rest at a later date. In other words, "conditional entry" is not for children whose parents haven't gotten them to the doctor's office or clinic for a shot. "If those children could get a dose 'today,' they're not supposed to be admitted to school," Watt says. To say it in reverse -- conditional entry is for children who cannot be vaccinated "today." Why couldn't you be vaccinated "today"? Here's one example: Children are supposed to receive two doses of the measles, mumps, rubella (MMR) vaccine. But the second dose can only be given starting one month after the first dose. If school starts less than one month after the child has had the first MMR dose, then the child is eligible for "conditional entry" to school, until the month has passed and the second dose can be given. Department of public health estimates show that more than 90 percent of those 24,000 children with conditional entry do not meet the requirements of the policy and should not have been admitted to school. Watt says the criteria have been misunderstood and "can be confusing," so the state's health department has been working with local health departments to inform them about correct use of conditional entry. In addition, schools financial and compliance audits for the current school year "will scrutinize reimbursements for attendance at schools with higher rates of conditional entrance." The department said it turned to approaches used successfully by the Alameda County Public Health Department. The state says Alameda had the biggest decrease -- 7.2 percent -- of any California county in its conditional entry rate. Statewide, the rate declined 2.5 percent. Watt acknowledged "there is a tension" between health requirements and school attendance, but even if children need vaccinations, there's "no need to be out of school for more than a day," Watt said. "There should not be prolonged absences from school because of the immunization requirement." Despite the increases in the rate of kindergartners now fully vaccinated "a number of schools and communities remain at risk of contagion," the state says. For the current school year, 20 of California's 58 counties have rates of fully-vaccinated kindergartners below 90 percent. Many of those counties also have high rates of personal belief exemptions. But individual schools even within counties with high fully vaccinated rates may have high personal belief exemption rates. You can look up the personal belief exemption rate at your own school below. You can also see the school search tool on its own page.